Identification: Adult moths are grayish brown with lacy brown lines on the forewings. 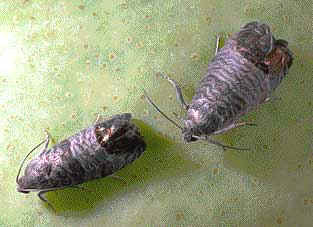 Larvae are pink with brown heads. Eggs are flat, white, and laid singly on leaves, twigs, and fruit buds. Biology and life cycle: Two generations per year. Overwinter as a full-grown pink larvae in thick silken cocoon in mulch or on bark. Economic importance: Destruction of fruit crops. Natural control: Braconid wasps, trichogramma wasps, and naturally occurring microorganisms. Birds, especially woodpeckers, and ground beetles. Organic control: Pheromones and pheromone traps. Insight: In the past this insect has been one of the hardest pests to control. Pheromones and pheromone traps have mostly eliminated the problem. 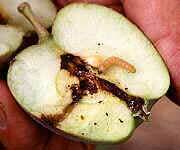 The codling moth was accidentally introduced into North America. Like other introduced pests, natural enemies didn't come along with them. It may take nature many years to regain a natural balance.